I took my memory card out of my broke down camera and put it in my older camera so I was able to capture these pictures. Only bad thing, the old camera doesn't have a video. You know what that means? No weekly wanna be until I get a new camera with a video. Maybe if I beg long enough like Amber did for her new camera I'll get one. "MIAH...get it out. Stop begging!!!" So one of Miah's favorite things is to clean out my diaper bag. Last week I somehow managed to spill an ENTIRE water bottle in the bag and everything in it was soaked. I didn't wanna go NEAR it but guess who stepped up to the plate? Miah. He cleaned it all out. Now some people may call this little guy stinky. He can't help that his guts don't hold his formula in. I like to call him A BRICK HOOOOUSE. Just lettin it ALL hang out. After church Miah said he wanted me to hear something. Hallelujah for sweet 4 year olds. Our minds are connected right now. That is sooo cute!! "Haiieeeluuahh"
Yay for Miah making my break from cleaning my room....so worth it!! Izey is like a baby supermodel...complete with his own signature "looks" like Zoolander and his "Blue Steel"!!! I love your kids! They are the best.....well, mine are really the best, but yours come's in a really close 2nd! Miah is too darn cute! Heavenly Father would agree! Hey, you can ask one of your great blog readers for your camera...and whoever buys it for you, you'll do a weekly thank you post to them! Its a win win situation!!! MIAH is adorable!!!!! 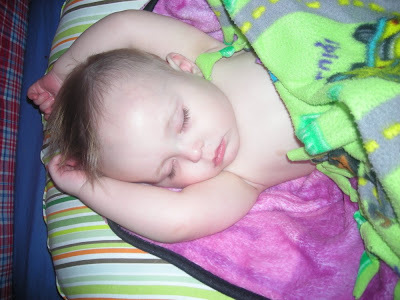 Izey is darn cute sleeping on his boppy--is that a boppy? And I love you having dinner delivered to the porch! Correction.. MY kids are the BEST, but I think yours and Amber's kids come in as a close second... ;) Miah is adorable.... as are the rest... Poor Izey's tummy... is the new designer formula working out better for him? I love Miah's singing! 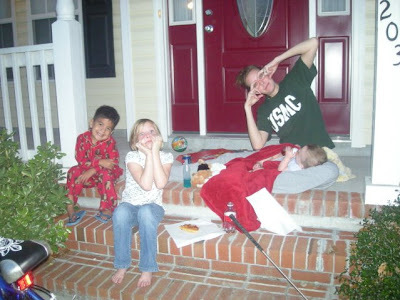 Dinner on the porch is NOT lazy, it's fun family memories. I bet the kids loved it just as much as you loved not having to cook. If Amber is calling that sweet little punkin stinky then maybe she should wash her upper lip and then stuff wouldn't stink. Oh my goodness, I want Miah to come and sing for me! Tell him I will pay him in loads of candy and whatever else he wants. He is so darn cute!! 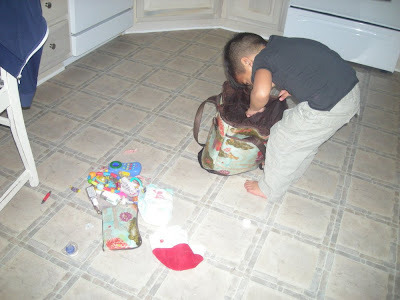 And what a super helper cleaning out the diaper bag. Those are the best babies!!!! I have the best grandchildren. Miah, I love your song and precious "donut baby" with his hat and all. Easter is just around the corner. So maybe the easter bunny will bring you a new camera! But then again, I'm not to sure how I feel about that. Sure it's around the corner, but it's a long sharp corner. And that's a long time to go without having one of those weekly-wanna be's. Oh well, I'm sure you'll make up for lost times. hehe. Miah is adorable, I just want to kiss his little face. Lucky for you I am clear across the country. Oh and I wish I could have a doughnut! I am way jealous! your kids are soo cute! I love your family stories! How's that new, expensive formula working out? Is his tummy getting better? Did Amber use the phrase "Heavenly Father"... dude, you are so close, Jessica! She's gonna convert any day now, I can feel it! Oh and your kids are always adorable, I don't know why everyone always sounds so surprised when they see a picture of them. I wanna blow a zerbert in that fun armpit. How did you resist?!?!?!?!?! i agree with dena...i was about to say i wanted to zurbert that baby arm...not the pit...too sticky...baby parts get really sticky when they are in creases. and GOSH i love miah....im so glad you snatched him up into our family!!! ps. i like how miah's wearing flipflops on the porch, b/c we all know he wouldnt wanna get his feet dirty.